This highlight reel perfectly captures the energy that is Live Oak International! Live Oak International is rapidly approaching this weekend, March 15th – 18th and the team at Ocala Horse Properties eagerly anticipates the best spectator event that Marion County has to offer! 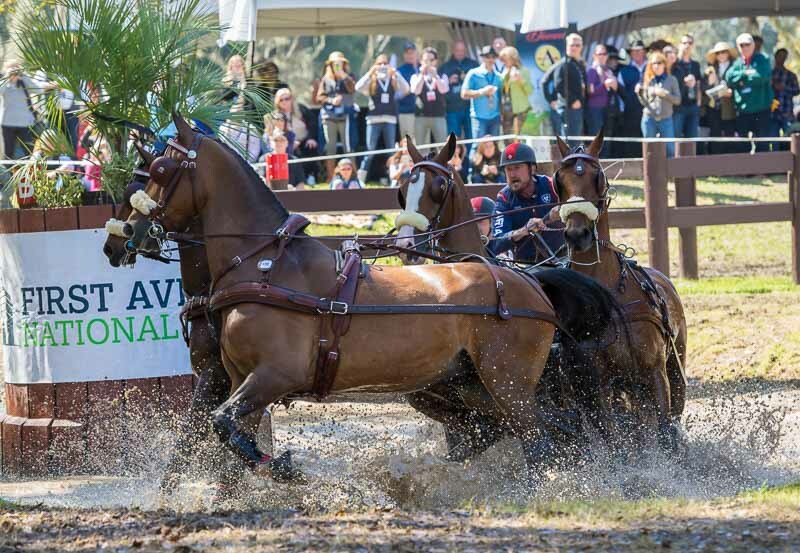 Located at the 5000 acre thoroughbred breeding farm of Mrs. Charlotte Weber’s Live Oak Plantation and home to twelve time world champion Chester Weber’s combined driving operation, Live Oak International has become a revered annual event. In it’s 27th year of competition, the event began as a combined driving event, but in 2014 the FEI level show jumping was added with great success. Event organizers anticipate upwards of 10,000 spectators returning this year to celebrate a weekend of world class equestrian competition. With so much to see and do at the event, we’ve taken the liberty to summarize the top 3 reasons to come to Live Oak International! Imagine attending the nation’s top USEF Combined Driving National Championship and the final Longines FEI World Cup of Show Jumping qualifier all in one weekend? What began in 1992 as a small Combined Driving Event (CDE) has grown into one of the largest equine events in the country! As a spectator, you will be able to enjoy watching the thrilling sport of combined driving set against the backdrop and topography of Live Oak Plantation. The CDE features 3 phases which take place over 4 days: Similar to the sport of eventing, CDE Dressage is judged on the precision of sequences and movement, the marathon phase tests speed and bravery over cross country obstacles, and the cones tests precision similar to a stadium round. Thursday and Friday is Dressage, Saturday is the Marathon and Sunday concludes with the Cones. Running concurrently with the CDE competition is 3 days of FEI level show jumping, which welcomes top competitors from over 25 different nations. The Show Jumping begins on Friday with classes running through Sunday’s $100,000 Longines World Cup™ Qualifier. The event is the final leg of the Longines FEI World Cup™ Jumping North American League qualifier for the 2018 Longines FEI World Cup Final being held in Paris, France in April. For the entire schedule of events, please Click HERE. #2 – Socializing, Tailgating, Parties and Shopping! If you want a break from the horse competitions, there are also plenty of opportunities to mingle, shop, eat and enjoy your favorite libation! Wander the show grounds as there will also be plenty of entertainment for the kids, retail opportunities and a variety of food and drink choices. Of course there are also the legendary VIP and competitor parties as well! On Saturday, Live Oak is holding it’s Inaugural Live Oak Tailgate Competition, with tailgate locations strategically placed around the CDE marathon course. Ocala Magazine is sponsoring this spectacle and there will be guest judges eyeing each spread, so bring your best theme with food, fun and decorations! When you reserve a tailgate spot you are automatically eligible to enter the tailgate competition! Tailgates are judged by a panel of local personalities. The winning tailgate will receive a prize (and bragging rights). #1 – Ocala Horse Properties is now a sponsor! Ocala Horse Properties has enthusiastically come on board as a sponsor for Live Oak International! Please join us at our booth in the vendor village as OHP is proud to take part in this spectacular event which celebrates the best of horse sport in our community. General admission tickets, week passes, tailgate reservations, and limited VIP packages are all available online or follow along with all the weekend’s action on the Live Oak International Facebook page. USEF Network will also be broadcasting the combined driving competition so if you can’t join us in Ocala, cheer competitors on from the live stream!